At the time she was writing Ongoingness, Sarah Manguso’s personal diary was eight hundred thousand words long. Never excerpted, this other text hovers on the edges of this book, just off the horizon, like how in any conversation the unconscious goes rumbling on invisibly underneath the words you’re speaking. This is not for her privacy: Manguso isn’t trying to hide anything from us. She writes that when a boyfriend of her youth snooped and read unflattering things about himself in her diary, the incident left him upset and her barely affected. She writes about the sleeplessness of newborn parenting affecting her memory, and the division of the day into unfamiliar new portions – not just night and day, or the day’s work and then rest, but sleeping and waking with the baby, up feeding him every couple of hours – “I was either asleep or almost asleep at all times”. Ongoingness is written in small, perfect passages, none any longer than a page, like polished chunks of quartz, glimmering with insight. There are sentences from this book that I have been aggressively quoting at people as if I am pulling a stone from my pocket and showing how it catches the light. Manguso writes about huge life events that people often construe as objective and universal (becoming an adult, grief, parenting) in ways that are intimate, careful, and personal. Ongoingness is also full of beautiful passages that, with the abstract precision that belongs to poetry, use subjects removed from her own life (such as the world’s oldest cave paintings, or the multi-generational building of cathedrals) in order to talk about her personal experience. It’s a book about language and text, and the tie between memory and language. Although Manguso’s diary is her memory as text, she writes about preverbal memory – things she remembers as images before she had the words for them. As baby food drips down her little son’s chin, she suddenly remembers the physical sensation of baby food dripping down her own chin, and the taste of it being spooned off her chin and back into her mouth again. “That dribbled food, already tasted and diluted with saliva, never tasted good.” These moments show us the world of early childhood, which we can watch from outside but so rarely remember for ourselves. And this way of thinking about memory, as separate from text, existing as image or sensation, emerges for Manguso alongside her pregnancy and her motherhood. couldn’t become a crutch for her memory, and deliberately didn’t take any photographs for the next twenty years. Reading this anecdote in particular, I fell for her utterly. This book is so internal and reflective that reading it I jump out of the rock pool of my life and into that of hers, which has a different temperature, and different seaweed. She writes about things I have never experienced and never will, which are totally specific to her, and also about things that haven’t happened to me yet, but will, such as leaving my twenties, and certain kinds of loss. It is an illuminating and wise book, which I think is impossible to read without being spurred to think about how you too are always actively remembering your own life while it happens to you or while you do it. Lenni Sanders is a writer and performer living in Manchester who makes interactive performance for heritage spaces with Curious Things and whose poetry has appeared in The Tangerine, Butcher’s Dog, The Emma Press Anthology of Love and Eyewear’s Best New British and Irish Poets 2018. 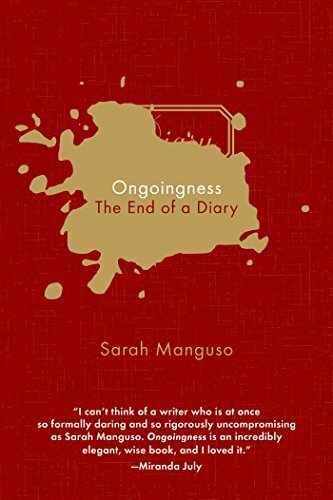 Posted in Reviews and tagged Book Review, diary, essayists, essays, Memoir, non-fiction, nonfiction, Ongoingness, Original Nonfiction, Review, reviews, Sarah Manguso. Bookmark the permalink.